American socialite Wallis Simpson, the woman for whom King Edward VIII gave up the throne, is famous for stating ” You can never be too rich or too thin.” This statement certainly cannot be applied to gardens- well, the bit about being too thin anyway……. 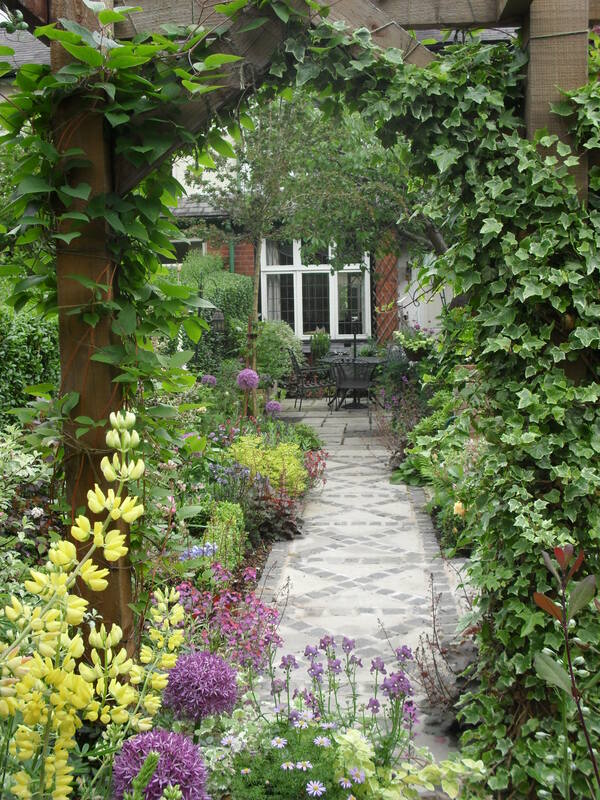 Long , thin gardens tend to look and feel like corridors where all you want to do is rush from one end to the other. The narrowness is somehow emphasised by the exaggerated length, giving the garden owner the feeling of being boxed in- quite claustrophobic in fact. The second area was formed by a simple step up onto an interesting path made by a combination of dark stone setts set into light grey Indian stone. Any pattern has the miraculous effect of slowing you down, whilst the simple bench invites you to pause, sit and take in the view across other gardens- often the most interesting view out from any garden. The planting here is very flowery and cottagey which also holds the interest, delineates this space as different from the others, and is yet another reason to slow down. Well you have to smell the roses don’t you? This was a lovely project and I personally really loved the finished garden- it had a cosy, soft feel to it, and I loved the distinctive character of each of the three areas. I prefer small cosy spaces- they have much more of a feeling of sanctuary about them, don’t you think?